The U.S. dollar is appreciating in value, a trend seen happening in the background of soundbites around trade tensions, tax cuts, and earnings projections. 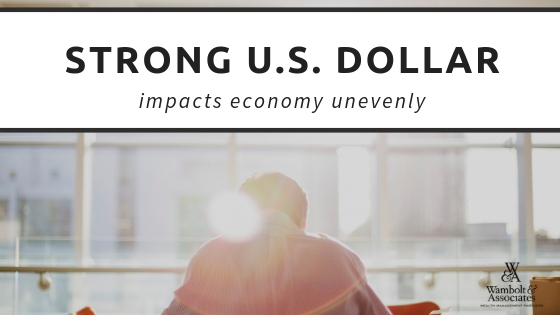 While we may not readily see the value of the dollar edging one direction or the other, we can identify the indirect effect in many different aspects of our economy. The U.S. dollar keeps climbing. As of the second week of November, the dollar index jumped 1.4% to a 17-month high. As the dollar strengthened over much of the year, exports out of the U.S. have gotten more expensive. Domestic companies selling overseas are having a tougher time selling their higher cost goods in foreign markets. The impact of the bloated dollar is further complicated by tariff and trade negotiations going on with China. Trade tensions pushed markets down beginning in September, only to open up today over news of a U.S. agreement with China reached over the weekend to pause the escalating trade war. Even though this “pause” is a minor step, it represents progress where there hasn’t been progress before, which was reflected in the markets. Longer-term, however, without a meaningful trade agreement with China, we can expect market volatility to continue (see How tough stance on trade is impacting the markets). A strong dollar makes foreign goods cheaper, giving consumers access to more goods at lower costs. This is certainly appealing to consumers with the holidays upon us. It also means cheaper foreign travel for global wanderers. On the flip side, we’re seeing greater trade imbalances with our trading partners abroad, who have seen their currencies devalued as the dollar strengthens. As tax cuts, spending increases, and deregulation helped lift the U.S. economic growth rate in 2018, other countries haven’t kept pace. The longer-term implications of this imbalance are just now becoming evident. Among companies with highly concentrated revenue streams from overseas, the strong dollar makes their goods more expensive, leading to discount pricing, shrinking margins and lower corporate earnings projections in 2019. This could ultimately have a trickle-down effect on jobs, sales and purchasing power into 2019. We’ll have to wait and see. Looking forward, analysts are tempering their projections for corporate earnings growth rates for 2019, as the benefits of the tax cut fade, trade concerns remain and that ever-present dollar remains strong in the background. 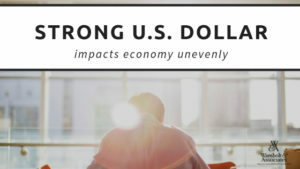 Who wins and loses in a strong dollar economy? Consumers of foreign-based goods and dollar-based world travelers. Consumer discretionary spending is up and retailers, restaurants, casinos, travel companies, airlines and cruise lines have all seen stronger demand. Imports. Businesses that import raw materials at lower cost and sell domestically. Foreign companies doing business in the U.S. and their investors. Multinational corporations with significant U.S. sales and income derived from U.S. sources. Exporters. Multinationals, manufacturing and resource producers with large overseas sales, particularly pharmaceuticals and technology. Tourism. Foreign visitors find it more expensive to travel in the U.S.
U.S. corporate earnings. About 40 percent of the S&P 500 earnings are generated from outside the Unites States, creating risk in those earnings, according to Michael Arone with State Street Global Advisors. Trade war begins – What’s next?